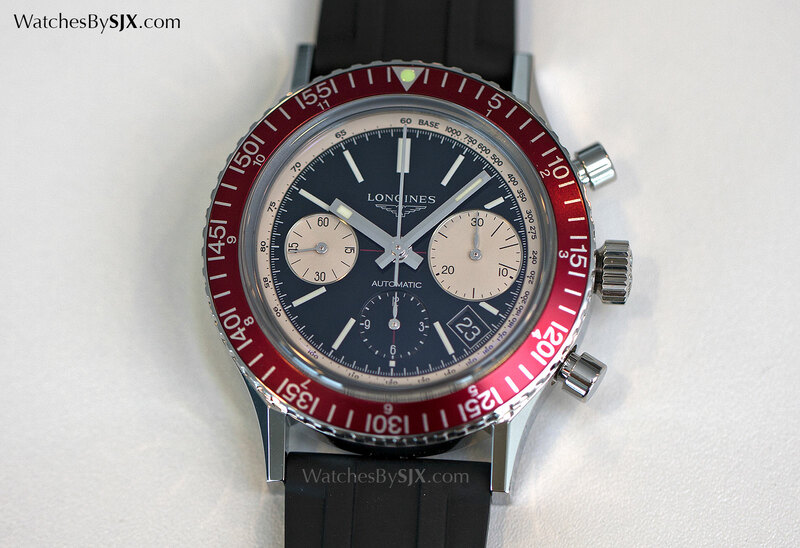 Longines’ latest historical remake is the Heritage Diver 1967, modelled on the Skin-Diver chronograph, one of the brand’s most distinctive diver’s stopwatches. 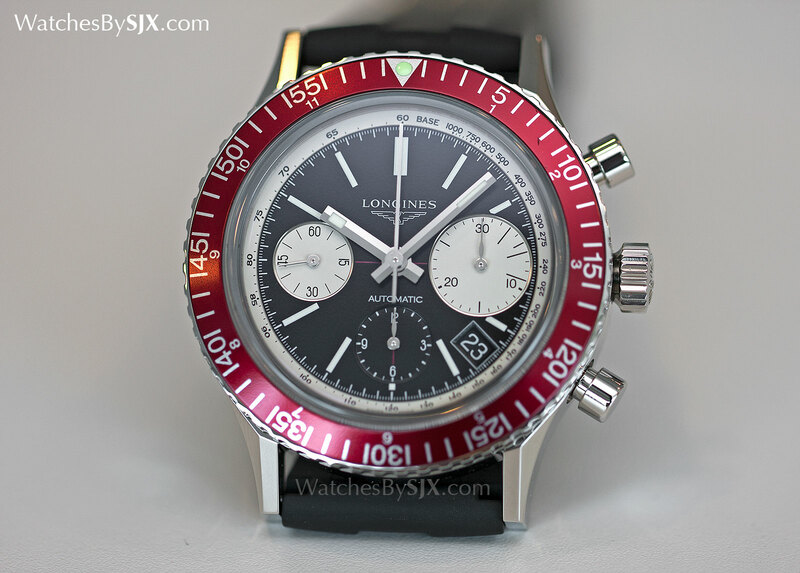 The typical formula Longines applies to its Heritage line of reissues is simple: take a signature design from its archives, throw in an automatic movement with a date function, and presto. A simple strategy but one that works well, especially when the resulting watches are honesty products and accessibly priced. The Heritage Diver 1967 is exactly that. 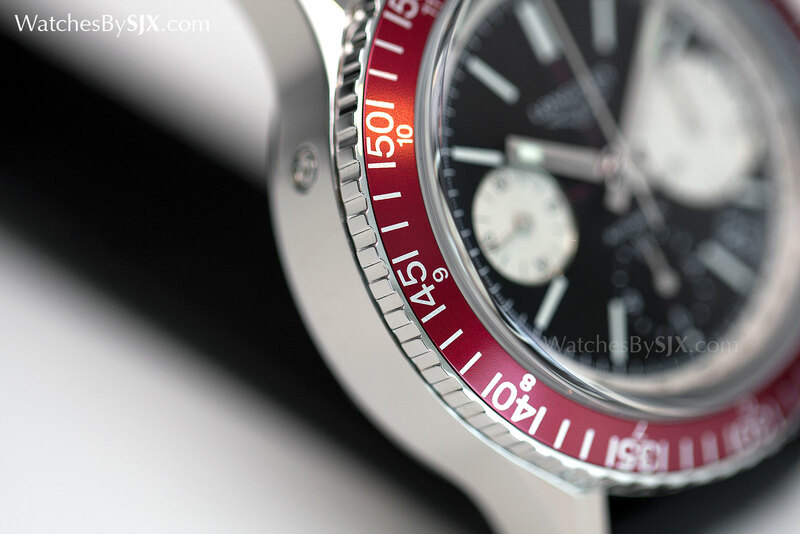 The Heritage Diver 1967 is a faithful approximation of the original, especially with the red aluminium bezel and block-shaped hands and indices. At 42mm in diameter it’s 2mm larger than the original, but by modern standards it’s a modestly sized watch. 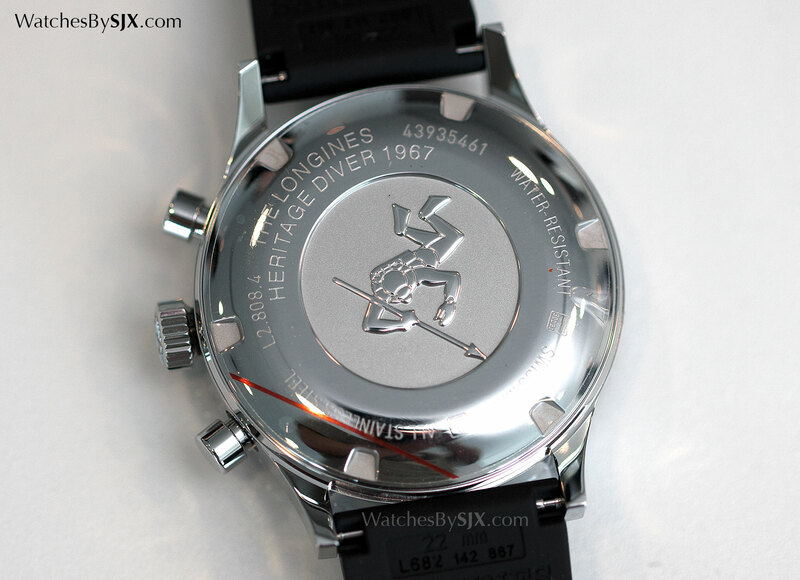 The case back is cast with a skin diver in relief, just as it was on Longines’ vintage dive watches. It’s also relatively chunky, a symptom of the L688.2 movement inside, an upgraded variant of the Valjoux 7750, a robust but thick movement. The L688.2 has a column wheel instead of a cam to control the chronograph, a feature traditionally found in more expensive stopwatches. 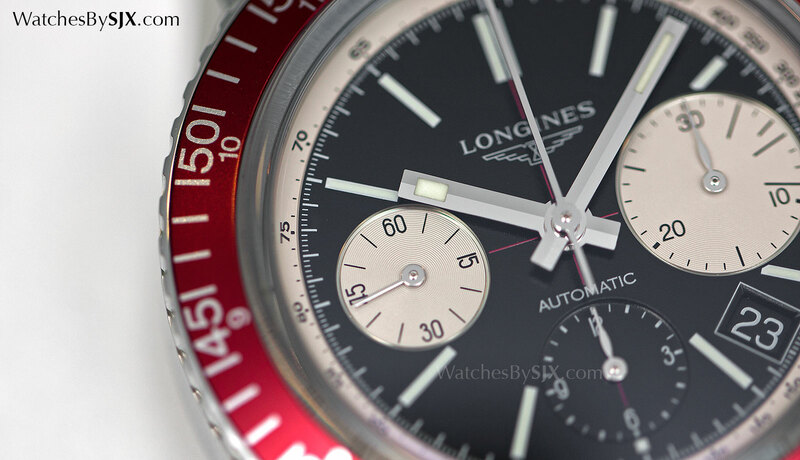 And it has a 54 hour power reserve, about six hours more than the stock 7750. One inconvenience of this movement is setting the date requires a pin for the pusher at 11 o’clock, instead of advancing it via the crown. That’s a consequence of the dial layout with counters at three, six and nine o’clock, meaning that the date adjustment mechanism has to be removed. The stock Valjoux 7750 has counters at 6, 9 and 12. 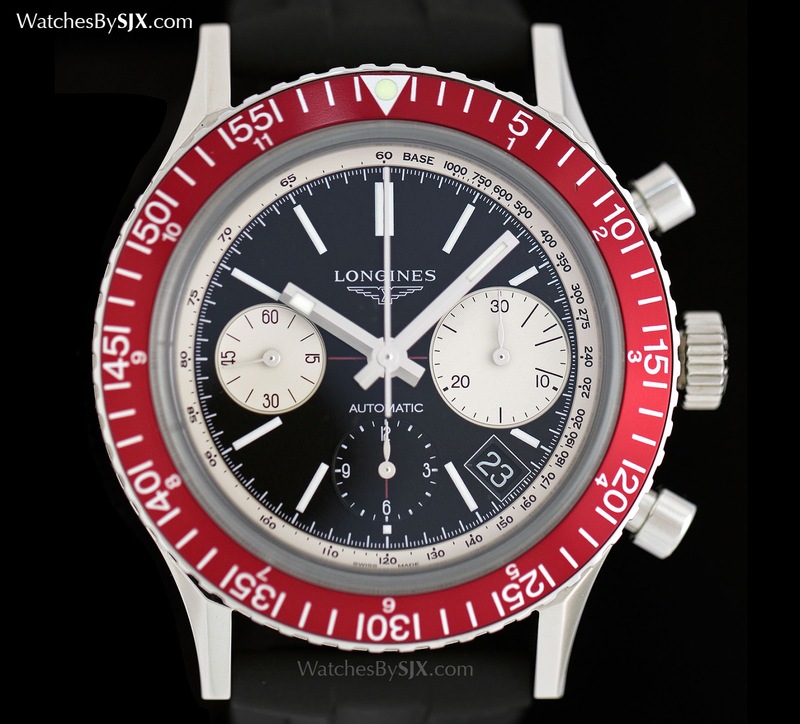 The L688.2 is a three register chronograph – seconds, minutes and hours – but the hours counter at six o’clock is black so as to blend in with the dial. This “ghost” register is because the original Skin-Diver only had two counters at three and nine o’clock. And in between four and five o’clock the designers have slotted in a date window. 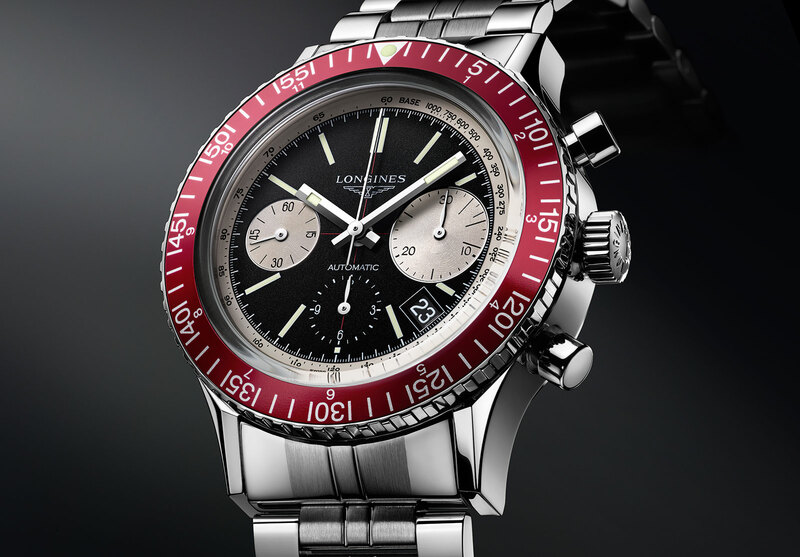 Traditionalists disdain this feature on vintage reissues, but a date function makes a watch easier to sell, something important for a brand as large as Longines (its annual revenue is about SFr1 billion). 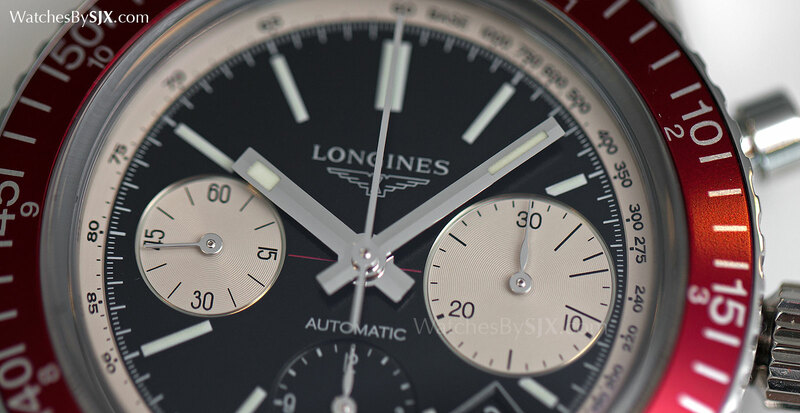 And unusual feature is the bezel, not because of its colour but the markings which make it dual use. 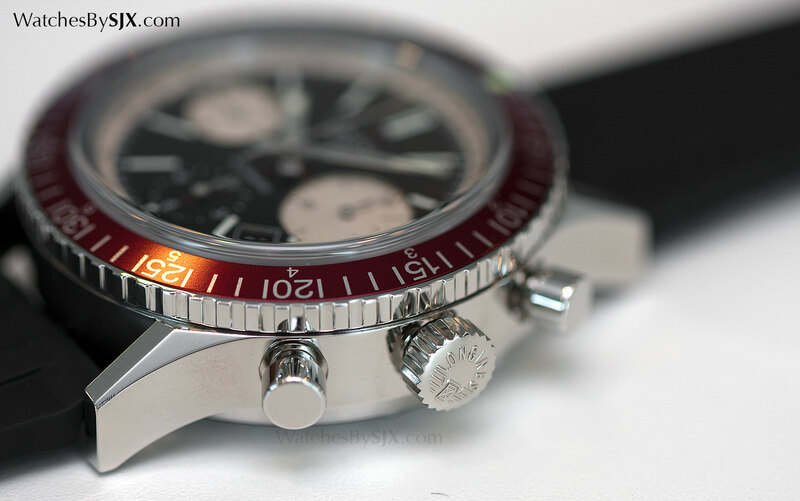 The outer numerals from “5” to “55” are to measure elapsed time for diving, while “1” to “11” on the inner track of the bezel are meant to indicate a second time zone. And the chapter ring around the dial has a tachymeter scale (to measure speed over a fixed distance), making this watch a chronograph for divers, aviators and drivers. The Heritage Diver 1967 is available on a rubber or crocodile strap, or a steel bracelet that looks like the original from the sixties. It retails for US$3100, or S$4770 with taxes, and will be available starting October 2015.